If you would have told me years ago that Madison would help bring Logan to the point of recovery then I would have told you how crazy you were! I was so overwhelmed at the thought of having a new baby along with a child with autism that I cried a lot. Logan was so much work then as he was still non verbal. He was prone to meltdowns. We were still fighting the School Board about his education. Life was chaotic to say the least. Then Madison arrived . Logan loved his little baby sister to death. Probably too much. We had to move her crib into our room to keep him out of it. He would “sing” to her, bring her toys, push her in her swing . She was his own personal McDonald’s toy. He couldn’t get enough of her. As Madison blossomed so did Logan. He played with her toys and with us more. The best thing that we ever did, besides having Madison, was when we made the decision that I should stay home with the children full time. It was a difficult decision to make but one that was sorely needed. Logan loved having his mom and sister available to him. I got to spend some great time just enjoying Madison. This allowed me to spend better time with Logan. I could use her toys when we played together meeting him at his developmental level easily. As they have grown, they have become best friends. When Logan was gone to camp, Madison was lost. When one of them spends the night away, the other wants to call them. It is so heartwarming to hear them playing and having fun together. Logan will watch Dr. Who just to have something to talk about with Madison. It’s not a show he would particularly watch on his own but he wants to be with her so much, he seeks out things she loves. Their relationship takes work on every one’s part, including Michael and I. We have to set up activities for them to do together. We have to make sure that Logan is able to be successful at them as well. We have to check in every now and then to be sure that Madison isn’t overcompensating for his deficits. Her world has always involved autism. She naturally picks up the slack in the relationship. She is so patient and kind with him. She wants him to be successful just as much as Michael and I do. She is his biggest cheerleader. As they have grown into teenagers, he has consistently remained near or just above her developmental level. I still hear her in the backseat prompting him to answer or explaining a situation to him. She will describe other people’s expectations of him based on their tone of voice. She will gently prod him to pay attention. She will ask him for help with her lessons. When he doesn’t handle a social situation correctly, she will gently rebuke him but lead him on how to do it better next time. I could not have ever envisioned a better or more patient guide for Logan in my wildest dreams. I encourage other parents all the time to spend valuable time enriching any sibling relationships. These are the people who are as invested in your child with autism as you. 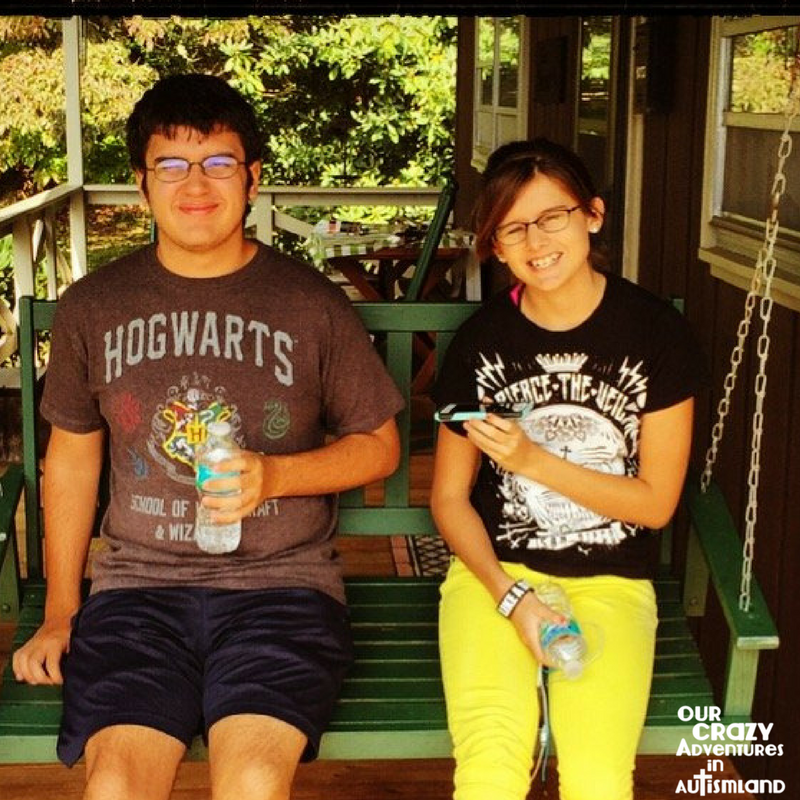 By encouraging sibling camaraderie, you will add yet another important tool into your autism arsenal. What an awesome post to read on a Sunday mornig with a cup of coffee! Thanks so much Tammy! I am so blessed! This is a beautiful post. My autistic son’s siblings have done many activities with him, but not to the success you have had. 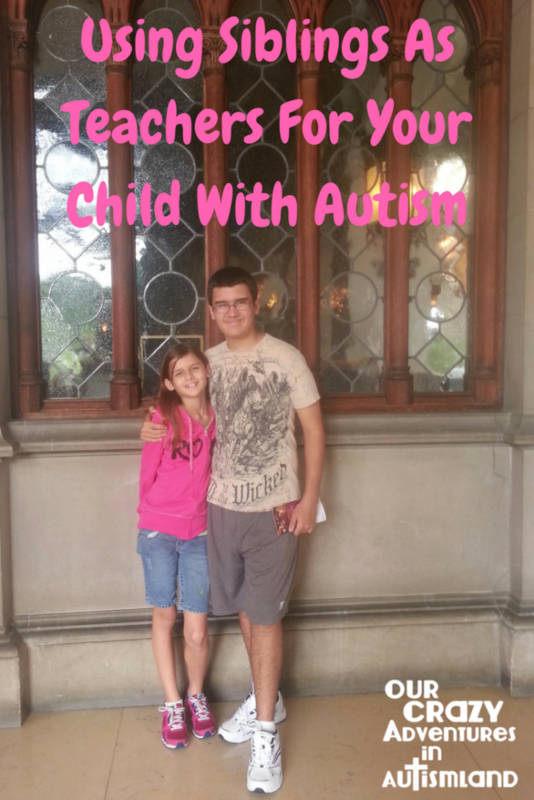 I do, however, agree that siblings can be the best teachers for a special needs child. Thanks Phyllis! I wonder sometimes if the siblings aren’t learning as much as the person with autism to prepare them for the world.